Today I stumbled upon a print ad in a newspaper about a real estate company. Ok, I didn't find it myself, it showed up in my twitterstream (thanks @Brilliant_Ads). Nothing special at first sight, but when you look closely at the ad, you can see they just took multi device usage to the next level. 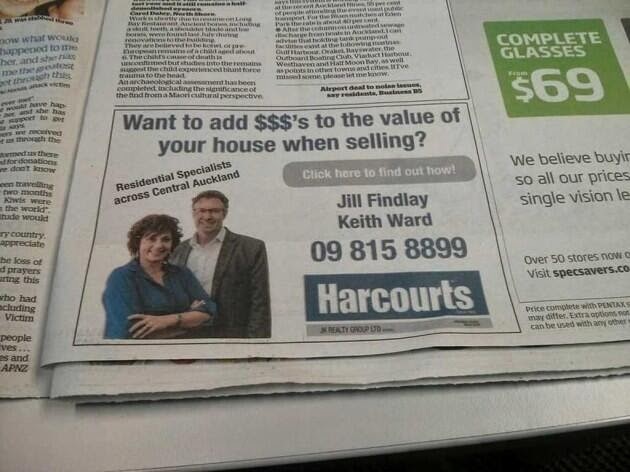 Recent research showed that a lot of people switch devices while performing a certain task (I mentioned this research earlier) and Harcourts is just ahead of this trend: click on this traditional newspaper print ad to find out how you can add $$$'s to the value of your house when selling! Some might say it's just a print ad fail, but is it really so absurd? Glasshole or not (I am - unfortunately - not), this might just be the future. Have a look at how Google Glass is used to make reading the newspaper more like reading a website at Engadget. It's about connecting anyone who reads the (actual, physical) newspaper to everything that doesn't make in on to the page, whether that's more photos, related articles, or video.